Flower. Fleur. Fiore. Flor. I dream of my own garden isle, but while I work on creating that perfect place I thought it’d be a nice to share some of the orchids I have in my collection. I own several varieties of orchids ranging from phalenopsis (also known as moth orchids) to dendrobiums. They can be extremely finicky, but when in the right conditions they will treat you to a spectacular show of beauty. I did lots of research on orchid care and found that a lot of it was experimental. There are so many factors that affect orchid growth, but the most important one is location. For me, it did not matter what medium the orchid was planted in, or what type of pot it was in. All that mattered was where in the house I was growing them. I tried growing orchids in the bathroom, but that failed because there wasn’t adequate light. I tried growing orchids next to my back door that faces south and that was still not right. Several dead orchids later, I found the perfect spot. My kitchen window faces west and is right in front of my sink. That area gets just the right amount of humidity and light so my orchids thanked me by producing healthy stems. Note: some orchids also do better outdoors (some varieties of dendrobium) or even planted in the ground (like cymbidiums). Ok, aside from location I’ll also share a few other tips for how to grow healthy orchids. 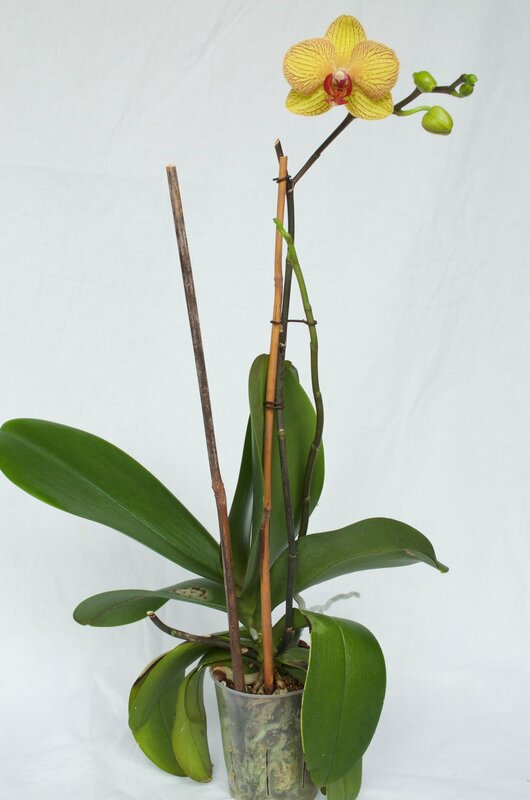 A clear perforated pot helps greatly with the orchids root system. The holes in the pot will help with air ventilation, as the roots need to breathe. When the pot is clear, it’s easy for the roots to get sunlight and easy for you to see if there’s any diseases/pests. You do not necessarily have to change potting medium. Some swear by bark medium and some by moss, but it’s really dependent on where you’re growing the orchid and how often you water them. I currently have two or three phalenopsis growing in moss and they have been doing extremely well. I don’t water those ones as much as moss retains water and easily leads to root rot. If you do notice any pests then definitely change the medium and be sure to isolate them to keep your other plants safe. Keep it in a slightly humid environment. I keep all my orchids together and each of them sits on top of a tray of pebbles that I keep slightly wet. This keeps the humidity around each of the orchids and creates an optimal environment for healthy growth. Keeping them near the sink is also a plus as that is a naturally more humid area than the rest of the house. Filtered light is important. 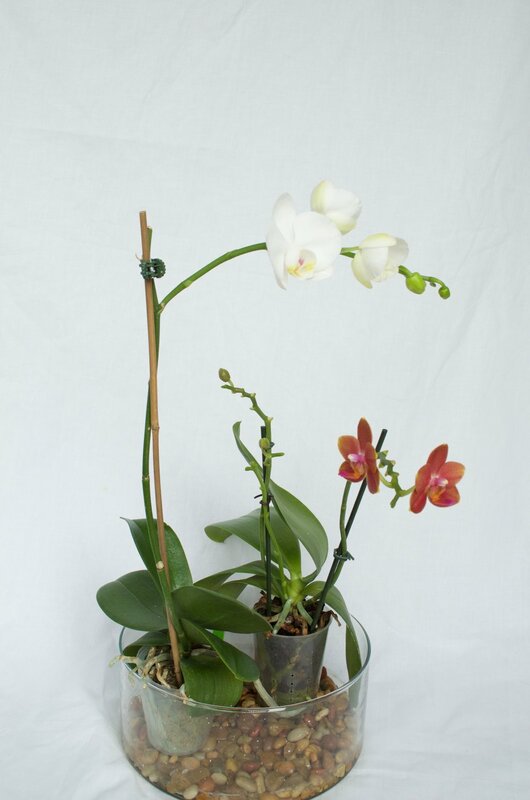 Most phalenopsis orchids cannot tolerate direct sunlight and if exposed will get burned. If the burn is bad enough, it can die. Since I keep my orchids in my kitchen window, I just used some wrapping tissue and taped up the areas of my window to protect my orchids from the strong rays. You can actually use anything you have around the house that will filter out some of the sunlight. Water carefully. The most important part when watering orchids is to not get water into the crown. The crown is where all the leaves sprout. If you do happen to get it wet, make sure to get a paper towel or anything that is very absorbent and get as much of the water out. 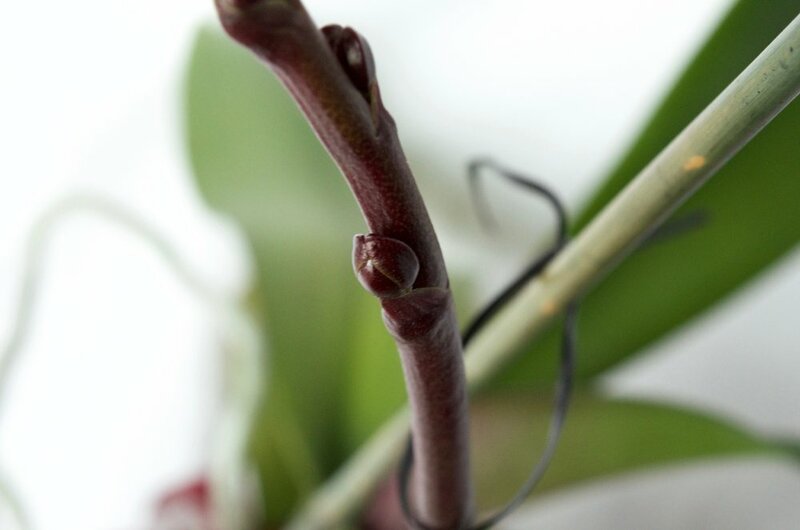 If it is not adequately dry, remaining water will eventually cause rot and your orchid will die. When I know my orchids are in need of a thorough watering especially during the summer, my preferred method is to have them sit in a tub of water for 5-15 minutes. Ok- to be honest I did forget once and it was in water for a few hours. As long as it gets to “air out” then you’ll be fine. In colder months I just pour some water into each of the pots and let the pebble tray do its job. Fertilize weakly, weekly. I forgot where I read that. So I don’t fertilize weekly, but I do fertilize weakly. Too strong of a fertilizer will cause burn on the roots and you must flush it out after. So, just remember a tiny bit will do!